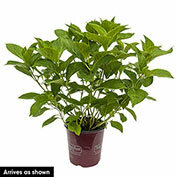 Foliage: Glossy green foliage, opposite, ovate leaves. Zone: 5 - 9 (-20° F.). 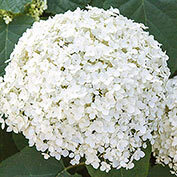 Flower Form: Tiny white fertile flowers, corymbs 2-6 inches across. 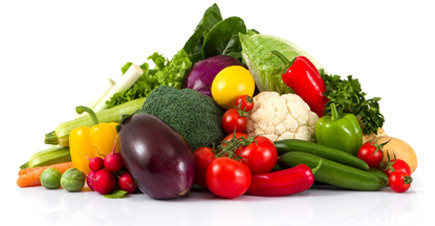 Soil Requirements: Rich, well-drained, fertile, moist soil. Not drought tolerant. Pruning: Plants may die to the ground in harsh winters. Bloom occurs on new wood, so plants may be pruned back close to the ground in late winter. 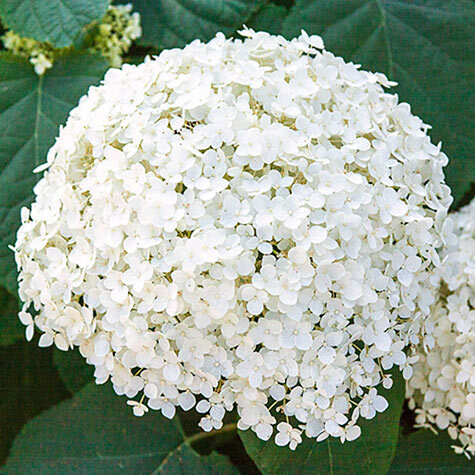 Size: 10-12-inch flattened corymb or cluster of small blooms. Comments: Mulch deeply to help retain soil moisture and protect for Winter. Flowers on new growth, so cut plant back to the ground in early Spring to promote best habit and flowering. Keep soil moist, not soggy. Hardiest of summer-blooming hydrangeas. Good for cut and dried flower arrangements. Flower color usually passes from green to white to brown. Foliage and buds may be toxic to some degree if ingested.